Novolipetsk Metallurgical Combine (NLMK), owned by Vladimir Lisin, has done something that no Russian steelmaker is on record as doing in the current downturn for steel production, sales, and profits; nor in the downturns which have preceded – 1991-93, 1998-99 and 2008-09. It is negotiating with steelworkers and their unions before deciding on how to cut costs. 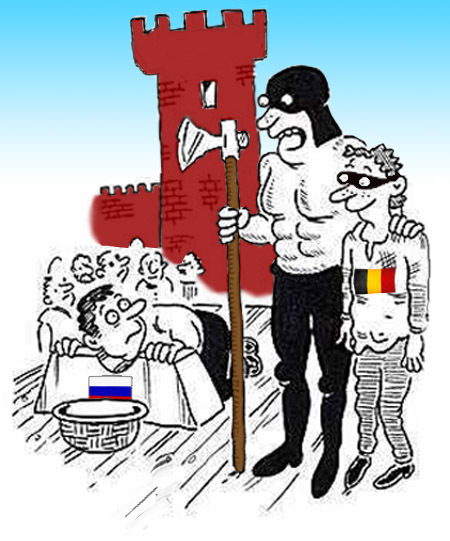 There’s a catch — that’s happening in Belgium, not in Russia. For months there have been public demonstrations in the traditional steelmaking Wallonia (Walloon) region of Belgium, between Liege and La Louviere, 112 kilometres to the southeast. Unions, regional government, political parties of the right and left, and consultancy studies have recommended a variety of options for reviving the steelmills and keeping steelworkers employed in the region; none would cost less than €300 million. There is also sharp local argument over whether the region would be better off in the long run doing without the steelmills. According to releases from NLMK, the management has opened negotiations with steelworkers at the La Louviere plant before finalizing a programme of cost cuts. Among the options aired publicly is the reduction of 600 jobs at the 2.6 million tonne-capacity plant, which is currently producing at a level of just 1.2 million tonnes. Yevgeny Lukashevich, spokesman for NLMK, told CRU Steel News that for the past five years the plant, previously operated by a joint venture between Duferco and NLMK, has received annual orders for no more than 1.4 million tonnes. “Projections for 2013 are very pessimistic and do not involve the restoration of pre-crisis indicators.” Steel products turned out at La Louviere include hot and cold-rolled coils for application in the automotive, construction, and engineering industries. According to Lukashevich, “in this situation the company should take urgent measures to stabilize the situation and exit from a crisis situation. The management of the enterprise addressed to the representatives of the workers the request to jointly analyse all the possible ways to reduce losses and restore the balance of the La Louvière and until the end of November to find an acceptable solution. Otherwise, the future of the enterprise will be under threat.” Asked to confirm local and Moscow press reports of job cuts, he said that until the management-union negotiations are completed, “the company does not comment on the course of the discussion.” A year ago, when NLMK and Duferco wound up their joint venture holding, Steel Invest and Finance (SIF), the rolling assets went to NLMK, and Duferco took section mill and other assets in Belgium. Not since 1991 has a Russian-owned steel group held direct negotiations with steelworker or mining unions to reach a consensus on financial controls, manning, and profit and productivity targets. NLMK’s approach to talk first before idling production and cutting jobs, is decidedly different from the cut first-talk later approach adopted by ArcelorMittal at its mills in Liege, as well as across the border in France at Florange. In Russia the latest round of quarterly production and financial reports from the major steelmakers reveals how falling demand for steel is affecting production and profit. NLMK’s financial release, issued on Friday, reports that its worldwide sales revenues came to $3 billion, down 8% compared to the second quarter; operating profit dropped 38% to $262 million; earnings (Ebitda) fell 19% to $483 million, while net profit plunged 40% to $167 million. On the production side, NLMK said it is managing to keep plant utilization (aka output and production jobs) relatively stable, with volume at 3.72 million tonnes, just 2% down from the 2nd quarter. Sales reported in terms of tonnage were at the record high level of 3.8 million tonnes, unchanged from the previous quarter. This, according to NLMK, reflected growing demand from the Russian construction sector, where sales tonnage grew 4% to 1.05 million tonnes, and in machine-building, where sales grew 5% on the quarter to 120,000 tonnes. In its steel operations in West Europe and the US, NLMK’s operating results were far worse. These are at mills in Belgium, France, Denmark, and Italy, as well as in Pennsylvania and Indiana. These operations reported a 3rd quarter downturn of 19% in sales tonnage; a 26% retreat in sales revenues; and a 96% plunge in operating profit. Over the first nine months of this year, the foreign steelmills have run up an operating loss of $229 million. NLMK’s Russian steel operations have compensated, keeping the entire steel division in the black, with an operating profit of $467 million. NLMK’s Russian steel production accounts for 65% of the group’s total in tonnage. Much the same picture can be seen in the 3rd quarter reports from the other major Russian steelmakers – growth in Russian demand, stimulated by direct Kremlin spending and indirect fiscal stimuli, has kept the profit line buoyant, and covered losses in foreign steel operations. Evraz, controlled by Roman Abramovich, cut steel production at all its overseas mills – in the Ukraine, US, Europe, and South Africa – during the September quarter, but offset these declines by an increase in crude and finished steel output at its Russian mills, which account for 80% of the group’s global total. Severstal has also reported a similar 3rd-quarter trend — positive growth in Russian steel sales, but decline in the North American division. Globally for Severstal, owned by Alexi Mordashov, crude steel output came to 3.76 million tonnes; that was down 1% from the second quarter. Crude steel production in Russia was 2.65 million tonnes, unchanged on the quarter, while in the US the volume slipped 4% to 1.1 million tonnes. Total steel product sales for Russia rose 6% quarter on quarter to 2.73 million tonnes, while they fell 10% at Severstal North America (SNA) to 1.08 million tonnes. The Russian share of Severstal’s steel production is 81%. Magnitogorsk Metallurgical Combine (MMK), Victor Rashnikov’s property, reports that its Russian mill performance in the last quarter was generally positive, with a 6% increase over the 2nd quarter in crude steel to 3.19 million tonnes, and 3% growth in finished steel output to 2.86 million tonnes. The weakness in the operational report was at MMK Metalurji (formerly Atakas) in Turkey. There crude steel output was slashed to 170,000 tonnes, down 40% from the 2nd quarter. The Russian share of MMK’s steel output is 92%. The weakest performance domestically has been at Mechel, the steel and coal-mining group owned by Igor Zyuzin, which has reported that production of crude steel slipped by 2% to 1.71 million tonnes in the September quarter, compared to the previous quarter.. In the sales results, long steel products grew by 8% on the quarter to 1.13 million tonnes, while semi-finished billets were up 6% to 726,000 tonnes. By contrast, sales of flat products, including stainless steel, fell back by 19% to 143,000 tonnes. Almost 60% of the flat steel sales reported by the company come from steelmills taken over by Mechel from the Estar group, after its owner Vadim Varshavsky defaulted on more than $1 billion of obligations in 2009. Mechel owns loss-making steelmills in Romania and the Ukraine, which it is now trying to sell, along with coalmines in the US. All the Russian steelmakers warn that the fourth-quarter results will be worse. But for the time being, Russian steelworkers are saying little about it. The one flashpoint has been in the Sverdlovsk region, where a series of strikes has occurred this year at the small pig-iron and cast iron producer, Verkhne Sinyachikhinsky Metallurgical Plant (VSMZ). The plant’s managing company, called Nigmas, was ordered into bankruptcy by a Moscow court in proceedings that ran from April to July. Debts of the plant were reported to exceed Rb1.4 billion ($440 million). Production had been halted at the plant last December, and since then the plant workers have mounted several demonstrations to recover past-due wages and severance pay. Partial payments followed. The latest demonstration began last week for payment of wage debts totalling Rb5.5 million ($175,000). At the same time local prosecutors say they have begun an investigation of fraud allegations. Lovano Trading, an offshore company based in Cyprus and a Saratov-based company called Volga Sar, are reportedly the owners of the plant, and most of the debt is owed to Petrocommerz Bank of Moscow. That almost a half-billion dollars in loans could have been raised against security of much less value is the basis for suspicion of fraud. Russian steelworker unions have been controlled by the steel company owners more tightly than the coalmine owners have been able to control the coalminer unions. Short-lived, often suppressed protests do occur from time to time in Russian steel towns, though. They broke out in 2009, for example, after Varshavsky walked away from his debts and his mills at Rostov, Zlatoust, Gurievsk, and Nytva. Though small and isolated, the reactions were sufficiently sensitive politically for regional governors to agree with the federal authorities on bailout measures. As prime minister in July 2009, Vladimir Putin was pressured to intervene personally to protect the workforce and payroll of the fareast steelmill, AmurMetall. Lukashevich for NLMK says his company has no comment. Kseniya Petrushko, spokesman for Evraz, responded that the request has been forwarded to the company specialists and she waits on their reply. That was a week ago. MMK’s spokesman, Polina Rudyaeva, promises to reply when she has collected the information. The Chairman and Deputy Chairman of the Mining and Metallurgical Union of Russia, Mikhail Tarasenko and Alexei Bezymyannykh, refused to answer.